Love the NoMakeup Look? This kit gives you everything you need for beautiful skin…A perfect collection for smoother, fresher, younger-looking skin! You get “natural beauty” polished perfection with Instant Line Smoother, a gorgeous multi-use cream blush and a transparent, line-smoothing finishing powder to create a Natural Glam look. Lasts all day until you wash it off. 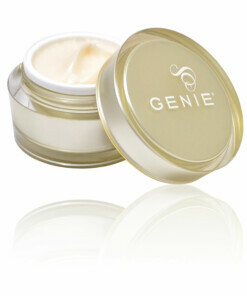 Perfect to erase the look of acne scarring, pitting and other imperfections. Can be used from your hairline to your bust line– on the bags and wrinkles around your eyes, mouth, forehead, lips, neck and décolleté – anywhere you want to look younger and smoother. Gives you beautiful younger-looking skin. Works with any skincare regimen or makeup you currently use. No Fragrance, No Silicone, No Oil, No Color. Love an uber-natural look? This is it– give your skin a quick polish and you are out the door! And this is can be used to set your foundation– Find out why Hollywood actresses and television newscasters rely on GENIE Cashmere Translucent Setting Powder—once you feel it you will know this is a game-changer. This transparent, completely clear powder sets your makeup so it lasts all day and creates a soft focus finish without overly mattifying the skin. Because it is Triple-milled it will never emphasise your lines or wrinkles. Comes with Kabuki brush. Apply two pumps of GENIE into your hand and apply all over your face including your eyelids and down your neck onto your decollete. DO NOT RUB THE PRODUCT IN. This may feel a little odd at first but just let it absorb into your skin. It should look “wet” when you first apply it. It should be dry in about 2-3 minutes. Then apply your make up as usual. If you want a greater smoothing effect or need more smoothing in a particular area (ie. under your eyes, etc.) go back and apply an additional layer in that area. Remember to let the product completely dry before applying more product. Apply Make Me Blush over foundation or onto clean skin. Use your fingers as the warmth of your fingers transforms the creamy formulation into a silky wash of color. Dot the apple of your cheek and blend it out onto your cheekbone. Use sparingly at first and build the depth of color desired by adding layers. Apply Make Me Blush, build the layers to create the depth of color you desire. Using your fingertips or eyeshadow brush, blend color over your entire eye area. You can create a variety of looks. Apply over whole eye area when you are on the go! Blend with your favorite powdered eye shadows mixing textures gives you a more modern look! Apply Make Me blush over your eyelid and use a lighter powder shade under your brow. For a more dramatic look, build another layer over Make Me Blush color. Apply with fingertips or lip brush. Apply to the center of each lip and work your way out to the corners. Create a different look by applying over your favorite lip color or apply your favorite lip gloss over Make Me Blush.